& remember - our Calendar is ALWAYS FREE! Book early to reserve your date! Remember to SIGN UP for Everything Angus Webmail! e-Feature Catalog + 1 email blast for $200 - save $25! Your own domain and website with up to 6 pages. Domain registration or transfer included (if required). Extra pages charged by development time. (web page changes must be based on initial design). Make as big as you want! 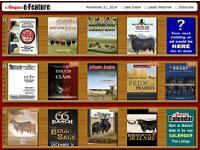 Angus Webmail is news you can use featuring Angus products & events across Canada. Sign up today and YOU decide what you want and what you do with it.